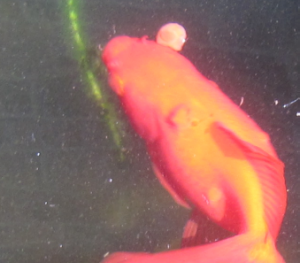 I have attached a picture of my gold fish and there is a spongy outgrowth in the gold fish. 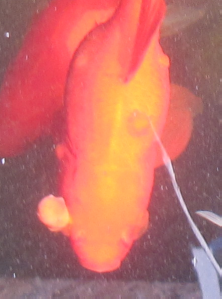 It doesn't appear as if the gold fish is troubled by it but the infection keeps growing and now it has now transmitter to another gold fish in the tank which shows a small growth of the same kind of outgrowth. What kind of infection is it and what kind of treatment can be given to cure this? If i don't cut off the viral tumor will the tumor kill the fish? or can the viral tumor be left as such. Please advise. I read through the FAQ's and mostly you have suggested to leave/ignore such tumors as such *(Unless the fish appears to be ill, **if its not eating well)* .Thank you very much for helping. We have a pond of 12 gold fish for the last 7 years. One has a number of growth. This is on the forehead and 5 more on the side of body. These has been steadily getting bigger over a the last 3 years. It does not seem to affect its appetite, and it is as active as the others. The grow is constant, does not seem to speed up over warmer period. The rest of the fish seems to be unaffected. We feed them commercial floating fish pallets, once a day in summer, and once every 4 days in winter. The pond is outdoors, has natural vegetations, and has a spray fountain that operates 4 hrs/day. The pool is facing east, located at the side of the house. It has 4 hrs of direct sun a day before noon. We live in a temperate climate (Melbourne Australia). What do you think this is, and Is this treatable. I understand the Crew are volunteers, and I appreciate your time and advice.